We are located in the greater Cincinnati area just 5 minutes east of Miami University in Oxford, Ohio. There are five farms in our family. They are located near Fremont, Ohio; Morgantown, West Virginia; and here near Oxford. In addition to the farms we have steak house restaurants. We proudly serve only Certified Angus Beef® steaks. Because of their consistent superior quality, tenderness and flavor our restaurants enjoy many repeat customers. The restaurants give us a unique opportunity to see product go all the way to the dinner table. This insight has guided us to select Angus cattle that produce high-quality steaks. The future of the cattle business is high-quality meat, not hamburger. The American Angus Association has recognized the family cattle operation as a Historic Angus Herd. The family was one of the first to gather performance data and use University Bull Tests. 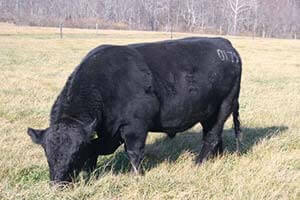 Now the focus includes growth, maternal characteristics, disposition and carcass quality. The Pedro family produces balanced-trait bulls for grass-based operations. The bulls produce strong performance daughters with high maternal traits to build a beef production system. An important part of our operation is to help educate surrounding cattlemen in animal breeding. Our international exporting of genetics has allowed us to develop partnerships that benefit everyone involved. If you are interested in developing a partnership that is beneficial to us both please contact us. carcass data at Pedro's Angus.